Star Wars may have taken place a long time ago and a galaxy far, far away, but the first two episodes of The Clone Wars managed to take us back to the feelings of possibility, excitement and, yes, mild embarrassment over the corny jokes, more successfully than you may have expected for an hour nonetheless. It may not have been "your new favorite show," as Cartoon Network's trailers boasted, but it was definitely better than Knight Rider, and that's got to count for something, right? 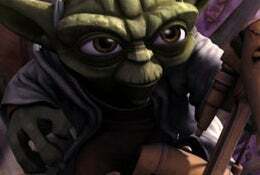 The two-episode premiere started with "Ambush," which seemed like an odd choice for a debut episode, considering that it lacked main characters like Anakin, Ahsoka or Obi Wan... but it did give us a particularly bouncy Yoda, some introduction and insight into the series' status quo (that the Clone Wars are as much about diplomatic disputes than just outright fighting, although that's here as well; that the good guys use brains more than brawn - well, it is a cartoon aimed at kids, what did you expect? - and that the clones may share the same DNA but are as individual as you or I) and most importantly, lots of action scenes. When paired with the following episode, the more space-centric "Rising Malevolence" (which did feature Anakin, Ahsoka, R2-D2 and Obi Wan - and a prototype Death Star, to boot), the premiere hour pretty much set out what the show was going to be as well as could be expected, and it's definitely enough to get me to tune in over the next few weeks. The problems with the show are pretty much the problems with this summer's preview movie - The writing is still overly simplistic and tends to substitute cliche for character, and the animation still has problems with making characters move believably - but the strengths make up for it, for now. The shorter format helps a lot, paring the writing down to a more plot-driven, speedier model that cuts dialogue in favor of action set-pieces, and the animation for that continues to impress... as do the little visual details the animators have built into the show (Ventress in particular looks amazing in every scene she appears in; I'm kind of waiting for her to kill Ahsoka so that I can love her even more). In the end, the show works if you're willing to let it be what it is; as a CGI show that brings Star Wars back to its start as an action serial for kids, it's pretty enjoyable - but if you were hoping for something that would live up to your adult fantasy of what you remembered the series when you were younger... Well, maybe you should read the Timothy Zahn novels or something.